Swansea City have proven that they will not be bullied by opposition teams, according to striker Oli McBurnie. The Swans were involved in another physical encounter on the weekend, a 0-0 draw at Tony Pulis' Middlesbrough. Graham Potter's side have already come through other bruising matches this season with victories at Sheffield United and Millwall under their belt. "Teams have tried to bully us this season, but we have stood up to it," said Scotland international McBurnie. "We have shown we are not a team that is going to be rolled over. There is a great team spirit in here and that comes from the gaffer and all the management. "The boys want to work hard for each other and the gaffer and I think you can see that in the performances. "Even when we are not at our best we have other qualities we have been lacking in the past and we are grinding out results." For all Swansea's determination to grind out results in recent weeks, they have struggled to find the back of the net. 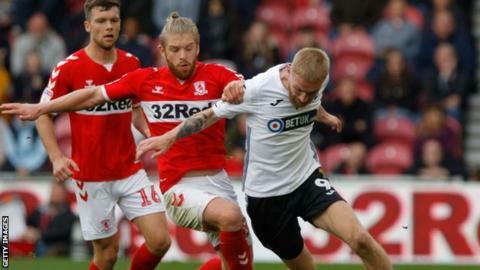 Saturday's goalless draw with Middlesbrough was the Swans' third consecutive match without scoring as McBurnie has temporarily lost his eye for goal. However the Swansea striker, who is his side's top scorer with four goals, insists the goals will return as he nears a return to full fitness after injury. "It's frustrating, I'm in the team to score goals," said McBurnie. "The goals will come and the chances will come, there are good enough players in the team to find me with passes then it's my job to finish it off. "I have been playing with a broken toe and a problem with one of my knees so it has been tough. "It's not ideal with all the games having knocks, but I'm always willing to put my body on the line for the team. "As a footballer you have to get through these periods where there are a lot of games and a lot of burden on my shoulders being the only striker, but I'm happy to be the number one striker so hopefully I will be back up to full fitness as soon as possible." Swansea are still without Ivory Coast striker Wilfried Bony, who has yet to play this season because of an Achilles injury.